Submitted by witness on Thursday, February 11, 2010. OBSERVED: It was around midnight and i was with two friends walking through a small forest less than a block from my house. we were standing around talking when we all heard what sounded like a tree branch snapping ( a rather large one) my friends kept talking while i was curious and investigated. after a few minutes of looking into the forest i saw something 7 to 8 1/2 feet tall about 15 to 20 feet from me staring directly at me leaning with one arm against a tree. it was the middle of summer and the forest we were in was very dense so all i could see was the outline of this thing. i called to my friends to come over and look at it, when they started walking over the creature turned and walked out of the forest and onto the road. honestly i was so scared i turned and ran down the trail, neither of my friends saw it but they believed me because they said they have never seen me so scared. we went back the next day to check out the area i had seen it in. now i go into this forest everyday so i know it well and there had been freshly made paths going through many parts of the forest including the spot where i saw it and the direction in which it went. there were also a number of branches and even a tree broken in half, and there was a very large tree that was pulled right out from the ground. about three nights later me and one of the friends that was there during the sighting were walking about 350 yards from the forest and it was a very foggy night, i couldn't see the forest or my house which were both very close by. we both stopped talking at the exact same time when we heard something crashing through the forest. this continued for about 5 minutes then stopped. ALSO NOTICED: just read the report everything is there, there have been other times when we have heard something strange but in a completely different area. OTHER STORIES: yes, there have been about 6 reports in the last 2 years and i have heard many stories from native tribes in moricetown about a hairy man wandering around the back roads and i have friends who have heard and seen tracks out in that area. Reportee gave some additional input into the original report. Smithers and surrounding areas have had many incidents in the past few years. I will be visiting the area this summer and will provide an update at that time. Note from Editor: The area does have a population so I reviewed a satellite map (see below). The Bulkley River, known for some of the finest fishing in Canada, is very close to the small woods next to the hospital mentioned (circled in red). 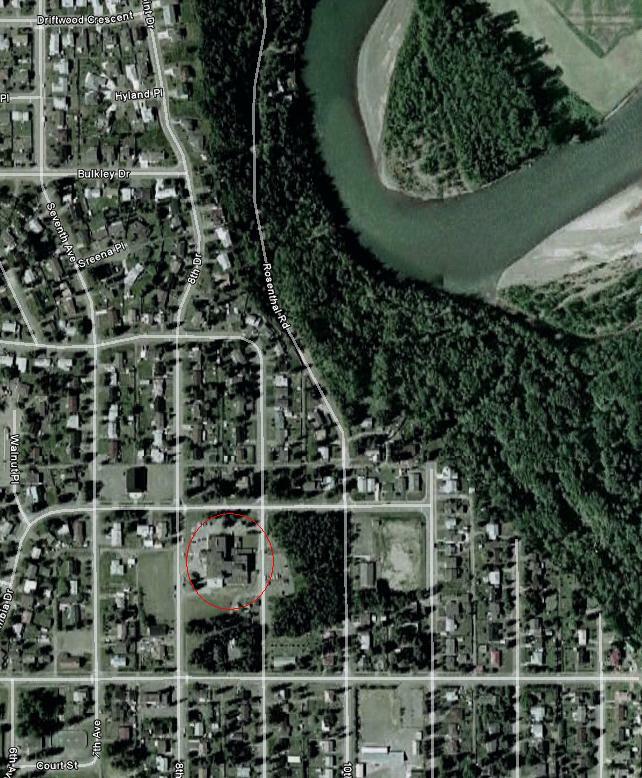 The river close by, along with the town of Smithers surrounded by three mountain ranges, suggests a possibility of this area being next to a travel route.